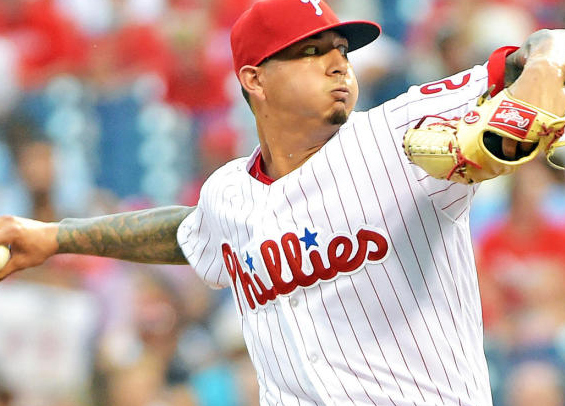 Vince Velasquez surrendered a career-high 10 runs as the Brewers walloped the Phillies Friday night at Citizens Bank Park, 12-4. The loss is Philadelphia's ninth over the last 12 games. "I don't think it's one thing," manager Gabe Kapler said afterward (see video). "I'd like to be able to give you the exact, 'Hey, we can point right here and this is why we're not performing a lot.' I just don't think that's what it is. I think collectively we're not performing the way we're capable." The ten runs over 3 1/3 innings that Velasquez surrendered is the most by a Phillies' hurler since David Buchanan gave up 11 runs in 1 2/3 in Arizona in August 2015. It's been a bad run of late for the Phillies, but an uninspired offense has been the main culprit. That was different Friday night as Velasquez sputtered from the outset, falling victim to a Ryan Braun three-run shot in the first. Things just got worse from there. Braun went on to homer again, a two-run shot off reliever Mark Leiter Jr. in the fourth. Velasquez entered Friday riding an impressive streak where he was 3-2 with a 2.14 ERA in his previous six starts. He had a 3.82 ERA prior to facing the Brewers, but by the time the fifth inning rolled concluded it ballooned to 4.95. His ERA for the month of June is 9.90. "When he came out the velocity was down a little bit, the stuff just didn't look crisp coming out of his hand," Kapler said of Velasquez. "He got through the first couple of innings and then in the third, the ball started coming out again. He gave us hope that maybe his mechanics were off in the first couple and then something clicked. Ultimately you guys saw it, the wheels fell off." The Phillies expected a better start to their six-game homestand, particularly after winning just three of 10 this past on a disastrous jaunt out west. Things don't get easier as the Phillies won't play a sub .500 team until hosting Baltimore in the first week of July. It's a long stretch of games against quality opponents, a chance to see how the club measures against the top-tier across baseball. The rut the Phillies sit in right now though is concerning. The Phillies hope Jake Arrieta can turn the tide on Saturday as he'll toe the rubber in a 1:05 p.m. start. The Brewers counter with left-hander Brent Suter.